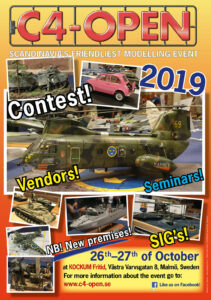 Soon it is once again time to open the doors to Scandinavia’s friendliest scale modeling event: C4 Open – held in Malmo, Sweden. As usual, our goal is to offer our visitors a first class show/competition with a large quantity of modeling subjects on display, an extensive hobby market and many interesting club displays. In addition, there will be inspiring lectures, a well-furnished prize table, and of course our social gathering on Saturday evening which many consider to be the highlight of the weekend with a perfect mix of socializing, discussions about modeling, food and drink. We will also continue with our well received and popular activities like Special Interest Groups/SIGs, as well as trial model building for the next generation of modelers. Below, some film taken at C4 open in 2015. C4-open was first held in 1991, and is regarded as one of the finest and kindest venues of its kind in Scandinavia.